BATON ROUGE, La. (AP) — Although LSU cannot win the Southeastern Conference championship, victories in its next two games will result in a regular season that exceeded expectations by a wide margin. The 10th-ranked Tigers need to beat Rice this Saturday and Texas A&M in College Station the following week for their first 10-win regular season since 2012. That probably also would put LSU in a New Year’s Six Bowl. 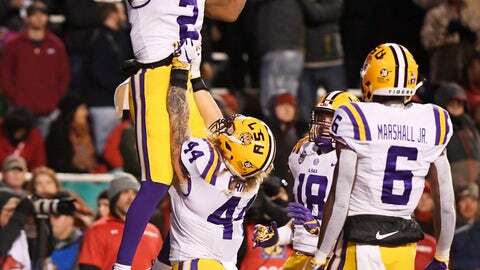 The Tigers did enough to defeat Arkansas 24-17 last Saturday. LSU squandered much of a 21-point advantage in the fourth quarter before running out the clock to preserve its eighth victory of the year. For the first time since the Ole Miss game in late September, quarterback Joe Burrow threw a touchdown pass — a 40-yarder to Justin Jefferson. However, for the fifth consecutive game, Burrow failed to throw for more than 200 yards. Moreover, the Tigers have had just one back rush for more than 100 yards in that five-game span. Clyde Edwards-Helaire ran for 145 yards in LSU’s 36-16 victory against Georgia. This season was expected to be a rebuilding year, largely because LSU’s offense entered the season with only three returning starters: tight end Foster Moreau, left tackle Saahdiq Charles and left guard Garrett Brumfield. LSU lost a fourth returning starter when right guard Ed Ingram was suspended indefinitely before the start of practice. Charles and Brumfield have missed a combined eight games. Those two players have been together on the starting offensive line just four times. “The offensive line has played good, but we have not been consistent,” starting center Lloyd Cushenberry said. “It’s a little mixture of everything. Sometimes things happen in football. Coming into the season, people thought we were going get demolished in every game. We have done well. LSU is a 40-plus point favorite over a one-win Rice team. The Tigers will have a greater challenge when they close the regular season at Texas A&M.